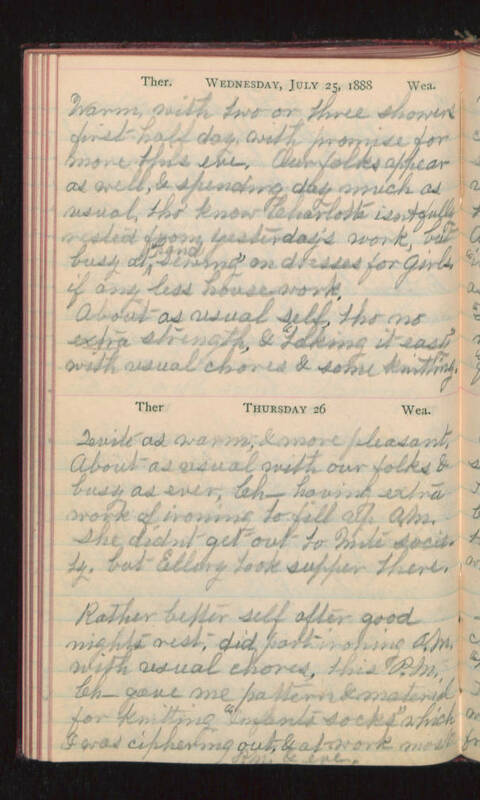 Wednesday, July 25, 1888 Warm, with two or three showers first half day, with promise for more this eve. Our folks appear as well, & spending day much as usual, tho' know Charlotte isn't fully rested from yesterday's work, but busy at "hand sewing" on dresses for girls, if any less housework. About as usual self, tho no extra strength, & "taking it easy" with usual chores & some knitting. Thursday 26 Quite as warm, & more pleasant. About as usual with our folks & busy as ever, Ch- having extra work of ironing to fill up A.M. she didn't get out to nite society, but Ellery took supper there. Rather better self after good nights rest, did part ironing A.M. with usual chores, this P.M. Ch-gave me pattern & material for knitting "infants socks" which I was ciphering out, & at work most A.M. & eve.